The development of scientific and innovation activities is central to the implementation of the university's principal mission as a centre of science, education and innovation. As a result, scientific research and innovation is one of the major components in the work performed by the university's academics, staff, undergraduate and post-graduate students. It is an integral part of coursework, refresher training, re-training and, in general, of training highly skilled specialists. Scientific research is targeted at the acquisition of fundamental knowledge, search for solutions to applied problems, creation of new education , social-and-humanitarian technologies, ensuring a high scientific level of professional training, development of methodological resources for innovations in science and education and putting research and development findings to use. The target is to ensure training of professionals, researchers and academics meeting world-wide qualification standards, to makean effective use of the educational, scientific-and-technological and innovation potential in order to develop the country's economy and address its social tasks. to improve the system of student scientific research. philosophical and ideological prerequisites for and logical and methodological foundations of social progress and social stability, personal development as well as the development of culture and education, formation of ideology of Belarusian society. Scientific-research work on the task of SPSI “Physical material-sciences, new materials and technologies” 3.2.01 “Developing a device for sharpening helicoidal chipping knives, used at woodworking enterprises, and a new technology of getting an alternating corner of cutting edge along the length of a knife” (№ SR 20160820 from 08.04.2016), research supervisor: A.Alifanov, Doctor of Engineering Sciences, professor, is carried out. According to the task of Belarusian Republic Fund of Fundamental Research, a project on the agreement № B16М-050 “Xylobiontic coleoptera of Mordellidae и Scraptiidae kinds as destructors of woods of dead foliar trees of main forest-forming species on the territory of Belarus” (№ GR 20163142 from 11.18.2016), scientific supervisor: A.Zemoglyadchuk, Candidate of Biological Sciences, is carried out. According to the task of Belarusian Republic Fund of Fundamental Research, a project on the agreement № G15М-021 “Research of complexity of social-economic system development of the Republic of Belarus in the direction of efficient usage of material resources” (№ SR 20151074 from 30.06.2015), scientific supervisor: V.Klimuk, Candidate of Economic Sciences, is carried out. The research work “The research of development of features of social-and-economic system of the Republic of Belarus in the direction of effective use of material resources” (No GR 20151074 from 30/06/2015) is being carried out on the instructions of the Belarusian Foundation for Fundamental Research, scientific supervisor: V.V. Klimuk, senior lecturer. The scientific research, carried out under the task of 5.2.07 “Development of scientific and technological bases of creation of high-strength gradient layers on the surface of steel articles and alloys, operating under impact loads, heavy wear using combined methods of high-energy and mechanical effects” (Reg. No. 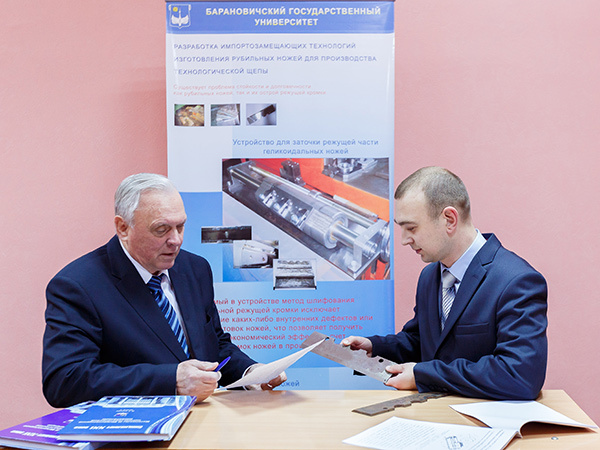 20141015 of 26/05/2014) within the framework of the SPSR “Functional and composite materials, nanomaterials”, is finished, scientific supervisor A.V.Alifanov, Doctor of engineering, Professor. The results of the research can be applied at machine-building and woodworking enterprises with the aim to prolong the term of metal- and wood-cutting instrument details exploitation. The research work “Necrobiont coleoptera of the fauna of Belarus” (No GR 20132355 from 05/11/2013), carried out on the instructions of the Belarusian Republic Foundation for Fundamental Research, is finished; scientific supervisor: D.S. Lundyshev, Candidate of Sciences in Biology. 113 kinds of necrobiont coleoptera are found on the bodies of dead animals on the territory of Belarus. Taxonomic structure of necrobiont coleoptera on dead animals is determined. Distinguishing peculiarities of necrobiont coleoptera system found on dead animals in different types of ecosystems are defined. The research work “Scientific-and-methodological grounds and development of a model of resource securing of inclusive education of trainees with autistic disturbances” (GR 20151440 from 07/09/2015), aimed at ensuring the activities of the Ministry of Education of the Republic of Belarus, was completed; scientific supervisor V.V. Khitryuk, Candidate of Pedagogical Sciences, Associate Professor. Here is offered a model of resource securing of inclusive education of trainees with autistic disturbances, which includes the following components: criteria-and-diagnostic, normative-and-organizational, psychological-and-pedagogic (scientific-and-methodological and technological), material-and-technic, consultative-and-informational. Model samples of scientific-and-methodological materials of structural components of resource securing of inclusive education of trainees with autistic disturbances are worked out. Fixation forms of accompanying groups with a trainee having autistic disturbances are worked out. The research work “Development and approbation of scientific-and-methodological securing of patronage of graduates, having special needs in their psychological-and-physical development, of institutions of secondary special and higher education” (GR 20150717 from 03/06/2015), aimed at ensuring the activities of the Ministry of Education of the Republic of Belarus, was completed; scientific supervisor T.R.Yakubovich, Candidate of Physics-and-mathematical Sciences, Associate Professor. Diagnostic instruments (questionnaires) for investigating the organization and quality of patronage of the graduates were worked out. The analysis of tpractice of such graduates’ patronage, its importance and necessity, prospects and ways of its development as a social institute were carried out; the most essential problems were revealed; the principles and terms of the patronage were formulated. Technological model of the patronage monitoring was worked out and founded; the monitoring matrix of the patronage was built. A model sample of practical guidance “Patronage of graduates of institutions of secondary special and higher education” was prepared. The scientific research is being carried out under the task of 5.2.07 “Development of scientific and technological bases of creation of high-strength gradient layers on the surface of steel articles and alloys, operating under impact loads, heavy wear using combined methods of high-energy and mechanical effects” (Reg. No. 20141015 of 26/05/2014) within the framework of the SPSR «Functional and composite materials, nanomaterials», scientific supervisor A.V.Alifanov, Doctor of engineering, professor. The research work “Necrobiont coleoptera of the fauna of Belarus” (No GR 20132355 from 05/11/2013) is being carried out on the instructions of the Belarusian Republican Foundation for Fundamental Research, scientific supervisor: D.S. Lundyshev, Candidate of Sciences in Biology. Computer database “Necrobiont coleopteran of Belarus” was created; the base includes taxonomic composition, imago activity time, registration place, type of carrion bait and the decay stage where species are marked. The research work “Tumbling flower beetles (Coleoptera: Mordellidae) of the fauna of Belarus as plant feeder of economically important plants (№ GR 20122899 from 10/09/2012), was completed on the instructions of the Belarusian Republican Foundation for Fundamental Research, scientific supervisor: A.V. Zemoglyadchuk, Candidate of Sciences in Biology. The analysis of the taxonomic structure of tumbling flower beetles (Coleoptera: Mordellidae), developing in economically important plats, was conducted for the first time. Biological features of Mordellidae were found out; the key to larva of tumbling flower beetles was also compiled. Two species of Mordellidae were specified for the fauna of Belarus. The nature of damage, caused by the larvae of tumbling flower beetles to economically important plants, was also defined. The research work “Scientific and methodological grounds, development and adoption of didactic model for the formation of inclusive culture of future teachers” (GR 20130500 from 26/04/2013), aimed at ensuring the activities of the Ministry of Education of the Republic of Belarus was completed, scientific supervisor V.V. Khitryuk, Candidate of Pedagogical Sciences, associate professor. The concept of "inclusive culture of a teacher" was defined; the peculiarities of professional and pedagogical activity in the conditions of inclusive education were revealed; the criteria and performance levels of formation of the components of an inclusive culture of the future teachers were defined; the competence content of teachers’ inclusive readiness was revealed; the diagnostic tools to determine the level of formation of the components of an inclusive culture of the future teachers were developed; the methodological approaches for constructing a didactic model were defined and justified; didactic model for the formation of an inclusive culture of the future teachers was developed and is being tested, there were identified its main units, formulated functionally meaningful description of each units; the system of principles, laws, pedagogical conditions of formation of an inclusive culture of the future teachers in the educational space of institutions of higher education in terms of competence-based approach was defined; the proposals to supplement the content of the higher pedagogical education (content of the educational standard of the Republic of Belarus. Higher Education. The first stage. Specialities: 1-01 02 01 Pre-school education, 1-01 02 01 Primary education; there were developed the content, implemented the reviewing of the prototype of EEMC “Fundamentals of inclusive education”. The separate innovation project "To develop advanced technological processes of blade production for cutting wood chips and to master the production» (No GR 20132356 of 05/112013) on the instructions of the Ministry of Industry of the Republic of Belarus was completed, scientific supervisor: A.V.Alifanov, Doctor of engineering, professor. The scientific research was carried out under the task of 5.2.09 «Creation of technological foundations of combined methods of hardening tools intended for metal and wood treatment using concentrated energy flows» (Reg. No. 20112709 of August 8, 2011) within the framework of the SPSR «Functional and engineering materials, nanomaterials», scientific supervisor A.V.Alifanov, Doctor of engineering, professor. A new high-energy method of hardening treatment of steel products, hardened as well as green, based on magnetoimpulse action, was developed for the first time in the Republic of Belarus together with the PTI NASB. Special magnetoimpulse installation and indicators, making it possible to carry out strengthening treatment for products of cylindrical and flat form, were designed and produced. Combined method of strengthening treatment of products, including vacuum coating and MIT, was also designed for the first time. The results can be recommended for practical use in a production environment to save expensive high-alloy materials for instrument production and made significant savings of foreign currency accordingly. The results are also of scientific and methodological importance and can be recommended for inclusion in the curriculum for student training of relevant disciplines. The separate innovation project "To develop advanced technological processes of blade production for cutting wood chips and to master the production» (No GR 20132356 of 05/11/2013) is being carried out on the instructions of the Ministry of Industry of the Republic of Belarus, supervisor: A.V.Alifanov, Doctor of engineering, professor. The recommendations for the detection and identification of potential pest of sunflower in Belarus - the sunflower Mordellidae (Mordellistena parvula (Gyllenhal, 1827), which can be used by plant protection service workers, agronomists and farmers. The data on species composition of tumbling flower beetles can be used in environmental monitoring, in the preparation of cadastre of fauna of Belarus, as well as in the educational process for lectures involving environmental issues, nature protection, for practices, for the implementation of theses, dissertations and coursework, for the development of methodological support of disciplines of biological specialties of higher education institutions. The research work “Necrobiont coleoptera of the fauna of Belarus” (No GR 20132355 from 05/11/2013) is being carried out on the instructions of the Belarusian Republican Foundation for Fundamental Research, scientific supervisor: D.S. Lundyshev, Candidate of Sciences in Biology. The implementation of the research work within GPNI “History, culture, society, the state” under the order 2.1.04 “International technology transfer as means of modernization of national economy” (No GR 20110868 from 16/05/2011) has been completed, scientific supervisor G.Y.Zhitkevich, Candidate of Economic Sciences, associate professor. lines of development of technological strategy of the country and Belarusian companies. The research work “Scientific and methodological grounds, development and adoption of didactic model for the formation of inclusive culture of future teachers” (GR 20130500 from 26/04/2013) is being carried out, scientific supervisor V.V. Khitryuk, Candidate of Pedagogical Sciences, associate professor. The diagnostic tools were developed and the data analysis of structural and functional components of inclusive culture of future teachers was carried out: principles and conditions were defined; technologies and techniques of forming inclusive culture of future teachers were worked out, the pattern of didactic model for the formation of inclusive culture of future teachers was developed; the main content blocks of the discipline “Fundamentals of inclusive education” were defined; pilot study of adoption of didactic model for the formation of inclusive culture of future teachers and data collection for the analysis of its effectiveness have been launched. Within the framework of the SPSR «Functional and engineering materials, nanomaterials», scientific research is being carried out under the task of 5.2.09 «Creating technological foundations of combined methods of hardening tools intended for metal and wood treatment using concentrated energy flows» (Reg. No. 20112709 of August 8, 2011), scientific supervisor A.V.Alifanov, doctor of engineering, associate professor. The results obtained during the research, showed high efficiency and promise of magnetic pulse hardening of tempered steel products, particularly of woodcutting blades made of tool steel. As a result of magnetic pulse hardening treatment of blades made of 8XФ and 8X6НФT steel, their wear resistence significantly improved and, consequently, their service life increased 1.5 - 3.0 times, thereby significantly reducing the consumption of expensive high-alloy tool steels at corresponding woodworking facilities. Within the framework of the SPSR «History, culture, society, state», scientific research is being carried out under the task of 2.1.04 «International transfer of technology as a means of modernizing the national economy» (Reg. No. 20110868 of May 16, 2011), scientific supervisor G.Ya.Zhitkevich, Ph.D. in economics, associate professor. Under the task of the BNFFR, scientific research is being carried out together with the FTR at the NAS of Belarus entitiled «Improved stability of surface hardening process of the cutting tool and die tooling parts by thermochemical treatment in a pulsed plasma low and high frequency glow discharge in a wide range of pressures» (Reg. No. 20120604 of February 20, 2012); scientific suprvisor A.V.Alifanov, doctor of engineering, associate professor. Scientific research is being carried out under the task of the BNFFR called «Gorbatki-Beetles (Coleoptera, Mordellidae) of Belarus Fauna as Phytophages of Economically Important Plants» (Reg. No. 20122899 of September 10, 2012), scientific supervisor A.V.Zemoglyadchuk, Ph.D in biology. The scientific research conducted under the task of the Ministry of Education of the Republic of Belarus on «Development and implementation of a model of psycho-pedagogical support of students from among those with psychophysical special needs in a university educational space» has been completed (Reg. No. 20112314 of August 5, 2011), scientific supervisor V.V.Khitryuk, Ph.D in pedagogy, associate professor. A dummy of a practical handbook called «"Special" students in higher educational estblishments: a model of psycho-pedagogical support» has been made up. The handbook is addressed not only to university teachers, tutors and staff members of psychological-pedagogical units of higher educational establishments, but also to teachers employed at pre-school, general secondary and secondary specialized educational establishments. The project done under the task of the BNFFR «Xylophilous coleoptera of the national park "Belovezhskaya Pushcha"» has been completed (Reg. No. 20102342 of September 15, 2010), scientific supervisor M.A.Lukashenya, university teacher. The research has revealed 764 species of xylophilous coleoptera relating to 58 families found on the territory of the national park. The research is pioneer work that revealed 74 species of coleoptera 7 of which have not been registered before in Belarus. 45 speciies of xylophilous coleoptera registered have an official conservartion status in Europe. The research has singled out basic stages of biological degradation of timber with a species of xylophilous coleoptera characteristic of each of them. An analysis has been made of the ratio of different trophic groups of xylophilous coleoptera at different stages of the biological degradation of timber. 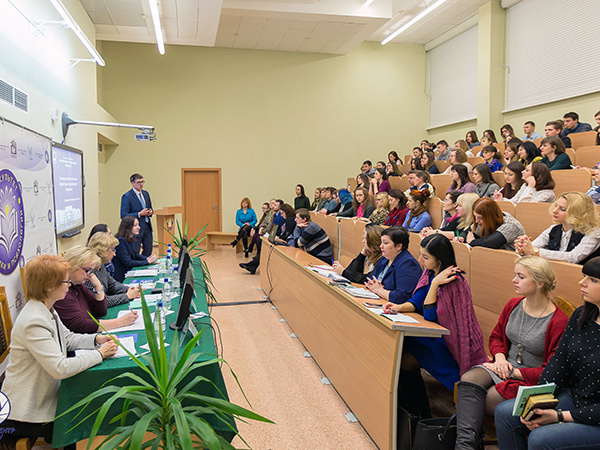 The first stage of the scientific research conducted under the task of the Ministry of Education of the Republic of Belarus called «Development and implementation of a model of psycho-pedagogical support of students from among those with psychophysical special needs in a university educational space» has been completed, contract No. ГБ 003/11 of March 1, 2011, scientific supervisor V.V.Khitryuk, Ph.D in pedagogy, associate professor. The first (diagnostic and prognostic) and the second (identification of possible problems (difficulties) milestones of the technology of psycho-pedagogical support of students from among those with psychophysical special needs have been passed at the institution of education Baranovichi State University; probable difficulties of cognitive, emotional, voilitional and personal character have been diagnosed; a series of adaptive training has been done for the students whose groups have those with psychophysical special needs; a seminar for tutors of student groups where students with psychophysical special needs study has been held and a thematic consultation for parents of students with psychophysical special needs has been given. A patent for invention No. а 20110813 called «A method and apparatus for determining the geometric shape of veneer assortments» has been applied for, authors Yu.K.Kalugin, A.V.Alifanov, N.M.Fedosov. An application for a utility model No. u 20110063 called «Selective optical irradiator of farm animals» has been filed, authors V.M.Blagodarny, V.V.Kuzmich, Yu.G.Markevich. An application for a utility model No. u 20110599 called «An apparatus for determining the geometric shape of veneer assortments» has been filed; authors Yu.K.Kalugin, A.V.Alifanov, N.M.Fedosov. Scientific research is being carried out within the framework of an economic agreement with the Committee on Agriculture and Food Supply at the Brest Regional Executive Committee, which is called «Development of science-based energy-saving technologies of cultivating winter barley and soybeans for the soil and climatic conditions of the southern part of the Republic of Belarus», scientific supervisor V.I.Kochurko, doctor of agriculture, professor. The research is being conducted on the varieties of winter barley called Theresa, Cindarella and Gregar and the varieties of soyabeans called Pripyat, Polessky and Yasleda. It is done at the study farm of Lyakhovichi State Agrarian College, a separate structural unit of the institution of education «Baranovichi State University». The program of research has been worked out: the aim and objectives of the research have been determined, outlines of experiments have been drawn up, necessary preparations for the experiments have been made. In accordance with the schedule of work, scientific literature on the theme of research has been analysed. A number of sources (articles in scientific journals, abstracts of theses, specialist literature) by domestic and foreign authors have been studied. Cultivation of winter barley and soybeans in regions of Russia and CIS countries as well as the main areas of research on the topic have also been studied, and basic methods of conducting analyses and observations under the program of the research considered. The work on the tasks performed within the State Comprehensive Program of Scientific Research «Economy and Society» for the years 2006 – 2010 called «Development, testing and implementaion of guidelines for the accounting of objects of intellectual property belonging to business entities of the Republic of Belarus» has been completed, Reg. No. 20061838, scientific supervisor G.Ya.Zhitkevich, Ph.D in economics, associate professor. A preprint of the handbook «Human Capital as a New Accounting Object» has been published, which mirrored a newly developed method of assessment, accounting and analysis of human capital (authors A.N.Korob, G.Ya.Zhitkevich). A technique of accounting the movement of certain types of intangible assets of industrial property has been devised: documenting, creation, delivery, gratuitous transfer, disposal, transfer to use, and registration in the accounts). The findings of the research found their reflection in collected materials of international theoretical and practical conferences. 2 acts have been drawn up on the use of the research findings in practice. An article called «Documenting Activities with Intangible Assets» has been published in the peer–reviewed journal «Economics and Management». The scientific research called «Development of a scientific concept and program of socio-economic development and innovation of Baranovichi region based on the most efficient use of resources and investment potential» has been completed, Reg. No. 20061837, scientific supervisor Y.I.Platonenko, Ph.D in economics, associate professor. The research analysed and systemized international experience, and a method of investigating the peculiarities of the of Belarus regional economy has been devised. Materials have been compiled in order to analyse and assess the potential of a comprehensive development of Baranovichi region. A science-based method of investigating the peculiarities of Baranovichi region's economy has been worked out. 4 acts have been drawn up on the use of the research findings in practice. Scientific research is being done under the task of the BNFFR «Xylophilous coleoptera of the national park "Belovezhskaya Pushcha"», contract number Б 10-066, scientific supervisor M.A.Lukashenya. Research has been done aimed at determining the taxonomy and ecological structure of xylophilous coleoptera found in the national park “Belovezhskaya Pushcha”. The areas of the future research have been defined, including both derived and indigenous forests as well as those that grow only in the forest reserves of the national park (the teritories of Korolevo-Mostovsky, Pashukovsky, Nikorsky, Belyansky and Yazvisnky forestries). 2 scientific articles on the findings of the research have been prepared. Scientific research is being done under the task of BNFFR "Coleoptera in nests of water and wading birds in the territories of near and proper Polesie Belarus", contract number B09M-047, registration number GR 20092817, scientific supervisor D. S. Lundyshev. The taxonomy of the coleoptera, found in nests of water and wading birds on the territories of near and proper Polesie Belarus and collected from 18 geographical points of Brest and Gomel regions has been determined. A progress report has been prepared, 4 scientific articles have been published, including 2 of them published abroad; 2 presentations have been given at international theoretical and practical conferences. The scientific research under the task of BNFFR “Structural and functional transformation of the biota of floodplain ecosystems of small rivers under anthropogenic impact" has been completed, contract number B 08-185, Reg. No. 2008207, scientific supervisor S. K. Ryndevich, Ph.D in biology, associate professor. Practical recommendations have been made on how to preserve the ecosystems of small rivers and forwarded to the Baranovichi municipal inspectorate of natural resources and environmental protection. The theoretical material obtained during the research has been integrated into university coursework of biological disciplines. These recommendations can be used by environmental inspectorates to monitor these ecosystems, by land users and research organizations to develop action plans aimed at conservation and rational use of biological resources found in the floodplains of the country’s small rivers. The findings of the research can be used in university and secondary school biology classes as well as while organizing ecological education events. The result of the work includes a final report, 1 handbook, 7 scientific articles, including 3 articles published abroad, 4 presentations at international theoretical and practical conferences. The final stage of the research has been completed under the task of 3.34 “"Investigation of the influence of a strong electromagnetic field on the structure and phase composition of heavy-steel products with a view to developing ways of improving their performance properties" conducted wthin the framework of SPDFR "High-energy, nuclear and radiation technologies", scientific supervisor A.V. Alifanov, doctor of engineering, professor. Two magnetic pulse installations have been made, the dependence between the amount of load destruction of samples with compressed infrastructure and the magnetic-pulse mode processing has been established, techniques have been developed to determine the twisting strength of cylindrically shaped samples using a device designed and constructed as well as using electron microscopy investigation of metal surfaces before and after treatment with electromagnetic field. The magnetic pulse installation СФТ 9.120.00.00.00.000 has been integrated into students’ coursework for practical and laboratory tasks in such disciplines as "Problems of Machine-Tool Construction" and "Technological Control of Machine Parts Reliability." An application has been been filed for a utility model No. и 20090149 of February 27, 2009, called "A device for accelerated testing of sewing needles," author V.M.Blagodarny, doctor of engineering, professor. An application has been filed for a utility model No. и 20090202 of March 17. 2009, called “A telescopic generator for indoor aerosol spraying", author V.M. Blagodarny, doctor of engineering, professor. The work done under the task of the BNFFR “Development and investigation of machine parts surface finishing strengthened with gas-thermal protective coatings applied by means of exposurc to mechanical, electric and magnetic energy" has been completed (scienific supervisor M.V. Neroda). The work on the project made it possible to conduct a number of studies. Experimental-industrial plants for magnetic-electrical grinding have been made, optimum conditions for the treatment of gas-thermal protective coatings have been obtained. Computer optimization of technological modes of magnetic-electrical grinding of gas-thermal coatings has been done. A mathematical model of the the treatment process has been devised. Prospects for further development and practical use of the results obtained have been studied. Within the framework of the SPDFR “High energy, nuclear and radiation technologies”, scientific research has been conducted under the task of 3.34 “"Investigation of the influence of a strong electromagnetic field on the structure and phase composition of heavy-steel products with a view to developing ways of improving their performance properties" (scientific supervisor A.V. Alifanov, doctor of engineering, professor). A plant for hardening metal products was introduced at the RTPE "Baranovichi Automatic Lines Plant" whose purpose is to investigate the influence of a strong electromagnetic field on the structure and phase composition of heavy duty steel products. Under the task of the BNFFR, scientific research is being done on “The structural and functional transformation of the biota of floodplain ecosystems of small rivers under anthropogenic impact", contract number B08-185, Reg. No. 20082071, registration date 11.08.2008, which is planned for the period of 2008 – 2010; project supervisor is S.K. Ryndevich, Ph.D. in biology, associate professor. Under the task of 1.22 SPDFR “High energy technology”, research is being done on “Investigation of the influence of a strong electromagnetic field on the structure and phase composition of heavy-steel products with a view to developing ways of improving their performance properties ", which is planned for the period of 2009-2010; project supervisor A.V. Alifanov, doctor of engineering, professor. Under the task of the Committee on Agriculture and Food Supply at Brest Regional Executive Committee, work is being done on “Investigation of energy-efficient technologies used in cultivation of winter barley and soya beans for the soil and climatic conditions of the southern part of the Republic of Belarus", scientific supervisor V.I.Kochurko, doctor of agriculture, professor. Under the task of the BFFR, work is being done on “Coleoptera in nests of water and wading birds in the territory of near and Polesie proper Belarus ", which is planned for the period of 2009-2011, contract number B09M-047, scientific supervisor D. S. Lundyshev. Under the task of the BNFFR, within the framework of the program “NAUKA-2007M, research is being done on “Development and investigation of machine parts surface finishing strengthened with gas-thermal protective coatings applied by means of exposure to mechanical, electric and magnetic energy”, which is planned for the period of 2007 - 2009, Reg. No. 20071700, registration date 06.07. 2007. Research has been done on the influence of technological modes of magnetic electric grinding on the heat buildup in the treatment areas of gas-thermal protective coatings. A pilot plant based on the horizontal milling machine НГФ -100 has been designed. Accessories for magnetic electric grinding (MEG) of cylindrical surfaces have been developed. Techniques of treatment of hardened surfaces in electric and magnetic fields have been studied. A patent for invention called “A technique of grinding gas-thermal protective coatings” has been applied for, No. a 20070071 of January 26, 2007. Research has been done on the treatment of CP-4 gas-thermal coating with magnetic electric grinding. Technological modes of MEG of surfaces clad with ГН1sormite and FB-17 ferroboron have been investigated. Mathematical dependences have been obtained and optimal treatment modes calculated. A package of documents have been prepared and a pilot unit based on the 3EБ42E grinding machine has been manufactured at the CC Baranovichi machine-tool plant “Atlant”. The research project " Conservation of biodiversity and development of ecotourism in the old-age parks of Baranovicgi district, Brest region” has been completed, (scientific suupervisor S.K. Ryndevich, Ph D in biology, assistant professor). The study examined 14 old-age parks in Baranovichi district. Pioneer work of the inventory of the flora and fauna species found in the ecosystems of the parks has been done, maps and diagrams of the parks have been drawn up, historical and cultural characteristics of the park ensembles have been prepared. The fauna of the parks registered 263 species of plants, 6 species of fungi and 637 species of animals. 4 species of insects have never been registered in the country’s fauna before, such as Aleochara sparsa Heer, Atheta incognita Scarp, Euglenes oculatus (Pancer), Polymerus holosericeus Hahl. New habitats of 10 species registered in the Red Book and another 10 species that need preventive protection have been found. Recommendations on maintenance, protection, restoration and use of the old-age parks in Baranovichi district have been drawn up, routes of nature trails for 7 parks, characterized by the greatest biodiversity, have been worked out. The findings of the research have been forwarded to the municipal inspectorate of natural resources and environmental protection. Within the framework of the scientific research called “Development, approbation and implementation of the guidelines for the accounting of objects of intellectual property belonging to business entities of the Republic of Belarus for the years 2006-2008” (supervisor G.Ya. Zhitkevich, Ph.D in economics), it has become possible to state that the existing accounting of intangible assets often leads to a distortion of the actual state of affairs in terms of accounting intellectual property and shows a lack of interest among entities to register these objects. The expediency of and approaches to the accounting and assessment of human capital in the Republic of Belarus have been researched. The problems of accounting the stages of R&D have been investigated and approaches to their solution suggested. Within the framework of the scientific research called “Development of the concept and program of social and economic development of Baranovichi district by making the most effective use of its investment potential for the years 2006 -2010” (scientific supervisor E.I. Platonenko, Ph.D in economics, associate professor), a theoretical basis for the social and economic development of the regions has been worked out taking into account an effective use of its resources, innovation and investment potential. The research analysed and systematised domestic and international experience of a region’s development. A conceptual approach to forecasting the social and economic development of the region has been developed.